What’s the most eco-friendly wall? Well there are several angles on that. Some of the most important aspects of walls are their insulation values, their air-tightnessA measure of how leaky a building is to air. In other words, how draughty it might be. There are now standard fan pressure tests to check how air tight a house is and the Building Regulations have minimum standards for all new houses (L1A – Conservation of fuel and power in new dwellings (England)). A much higher degree of air tightness is covered by the Passivhaus standard, the embodied energythe total amount of energy it takes to make a material (or a building). See more on embodied energy and the sustainability of the materials used. Thermal massthis is about how much heat something can absorb - so it involves its specific heat capacity and its volume. It can be useful for levelling out the peaks and troughs of temperature within a house. See the page on thermal mass may be a factor. This is sometimes more serious than it sounds. In the UK we are generally used to masonry walls with very few penetrations. Air bricks are designed so that mice cannot get through. (The rule of thumb is that if you can poke a pencil through a hole then a small mouse could get through, and grow and breed).With timber frame housing, there is the possibility that rodents might find a way in and steadily chew their way round the structure. Particularly in autumn, rats, mice and grey squirrels seek warm quarters for over-wintering and they can steadily gnaw their way past timber, wood fibre insulation and plasterboard. If they can smell food on an air current passing through the structure then this is an added incentive for them to spend long hours chewing away. Not only do they do damage to the structure, they will get in if possible to get food and at the same time create channels for drafts. Rodents spend a lot of time gnawing in order to keep their teeth in good condition.They may destroy polythene vapour barriers (which can then cause condensation and damp) and may gnaw through plastic plumbing pipes if they encounter them. With plastic plumbing they tend to stop chewing when they encounter water. This tends to create a very small leak which can be an enormous problem if it goes unnoticed because it will rot timber and possible allow dry rot to develop. Party walls are covered in the Building Regulations, Part EThe Approved documents, (England) part E, deals with resistance to the passage of sound and with traditional masonry construction the sound insulation is usually achieved by the density of the wall (and making sure that there are no weak points such as perpendsA vertical layer of mortar between two bricks or blocks which have not been properly filled with mortar. However, with timber construction, party walls can still achieve the required degree of sound insulation mainly by isolating elements rather than adding mass. Fixing things to walls (such as shelves, pictures, furniture etc.) depends on the structure of the wall. Solid masonry walls can usually carry huge loads if the correct fixings are used and it does not matter much where the fixings go (although things can occasionally become difficult if the fixing falls on a mortar joint.With timber frame walls it matters whether the fixing is going into timber frame studwork behind, or is simply going onto the plasterboard (or wood fibre layer). If it’s possible to get the fixings to coincide with the studwork then it works well using long screws but if the fixing position falls between the studs then some kind of expanding anchor has to be used and these tend to be expensive and fiddly. And that is apart from the visual and cultural aspects. to avoid the ‘cooling fin’ effect caused where internal walls connect to external ones. Internal walls which connect with external ones will also need insulating on both sides for about a metre back from the external one. See below. The above plan shows how an internal wall[for the purposes of part E of the Approved Documents] - Any wall that does not have a separating function. 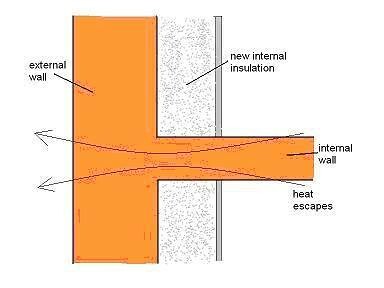 connecting with an external solid wall causes a direct pathway for heat to escape out. External insulation prevents this but internal insulation has little effect. Of course cavity wall insulation isolates internal walls from external ones but 50mm gives a very low level of insulation in the first place. Below is one way to avoid this problem by returning the insulation about a metre back up the internal wall. External wall insulation is not straight forward. You may need planning permission to add insulation to the outside of an existing building. Contact the local planning department at the council. Considering the work involved in insulating the outside of a building it makes sense to add as much insulation as is feasible while you are doing the job. 100mm would seem like a minimum, 200mm sensible and 300mm would mean you might be able to achieve Passivhaus standard. This of course will most likely entail the repositioning of gutters, fall pipes and possibly gullies. It could necessitate extending the roof downwards and outwards to cover the extra wall thickness and it may mean some fairly nifty detailing round openings, particularly windows. 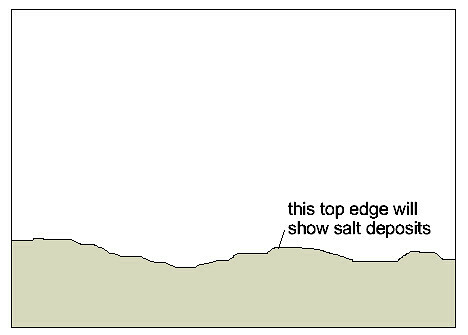 This may also have implications for the eaves level in relation to the tops of windows. You also need to give some design consideration to how the roof or loft insulation meets the new wall insulation to avoid cold bridgingthis is a pathway where heat can easily escape (or get in) through some part of the structure. It is usually caused by some element of structure such as a steel lintel or wooden studwork. Also known as a thermal bridge. see more on cold bridging. Avoiding condensation and allowing traditional walls to breathe are also crucial. Another complication concerns vapour barriers. With many older buildings there can be disastrous results if vapour barriers are not incorporated properly. See Vapour Barriers. So far very few already existing houses in the UK have been upgraded with external insulation though on the continent there is plenty of activity in this area. One of the few books on the subject is The Complete Guide to External Wall Insulation by Christopher Pearson. These problems can apply to new build and retrofit. This is a particular problem where solid sheets of insulation such as polystyrene are used. In some cases it only takes a gap of a few millimetres between sheets to completely spoil the efficacy of the insulation. 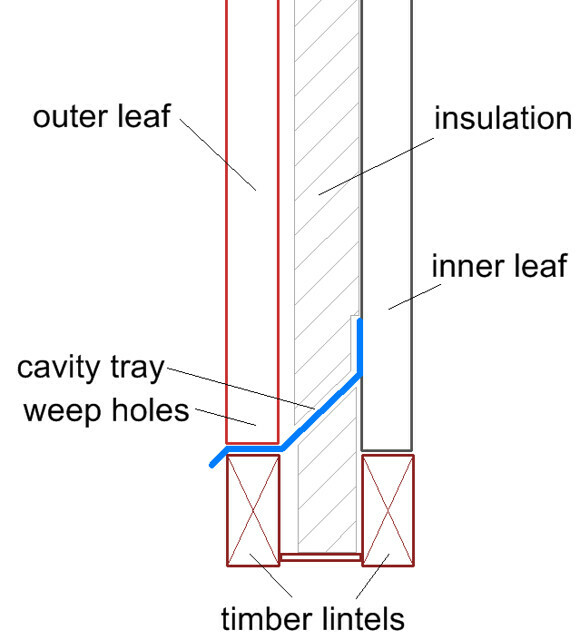 Take for example a traditional cavity wall which gets insulated using expanded polystyrene sheets and imagine that the sheets fit closely but have slight gaps because they were not cut perfectly or mortar snots hold them away from the inner leaf. As can be seen, the inner leaf is subjected to a stream of cold outside air and has virtually no insulation. Something similar happens with mineral fibre, especially at joints and edges. If a number of such cavities link up then this can form a huge source of escaping heat. this tends to happen when there are areas which are inaccessible or where a spray in product such as warmcell is being used and it is physically impossible to reach the area. This can easily happen at the eaves or in complex areas where there are extra noggins. This problem needs addressing at the design stage. this can occasionally happen with insulation such as Warmcell, polystyrene bead and any other poured or pumped insulation. In the case of Warmcell in floors it should be packed in quite tightly so that if it settles slightly then it is still in contact with the lower surface of the floor itself. if the wall design includes cavities then it is most important that they don’t get accidentally bridged by using the wrong kind of insulation. This can happen particularly with mineral wool being badly fitted and the result is that moisture may find its way over from the outer leaf to the inner one. This is when air can blow through the insulation itself and carry heat away. It typically happens with fibre insulation which has no external seal such as building paperstrong kraft paper used to prevent thermal bypass in wall insulation or sarkinga waterproof layer in a roof which acts as backup protection in case the main layer fails. Usually a membrane or board and usually situated between roof laths and joists. board up against it. It can also occur due to stack effect. There is a quite complicated discussion going on amongst building technologists about the thermal mass of buildings and its affect on storing solar energy and thermal stability generally. This partly concerns the Decrement delay value. To maximise the thermal mass without having overly thick external walls it makes sense to construct the internal walls (and possibly floors) of high density material. This is now beginning to enter into the building regulations. external leaves of masonry walls such as stone, brick and blockwork. Also cement render if it is not in perfect condition. To prevent moisture absorbtion there needs to be a thin layer or membrane, usually plastic, inserted between the damp outer surface and the dry inner one. at the base of walls to prevent damp rising from the ground. 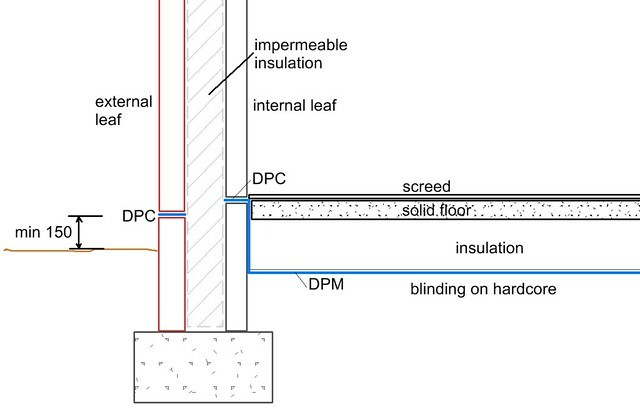 The damp proof course (DPCDamp Proof Course - a strip of (usually) plastic built into walls to prevent damp rising or penetrating. see more) is a way of preventing damp from the ground creeping up into the walls and causing problems. It is mandatory in the building regulations to include some way of doing this. With typical masonry building such as brick and block it is normal to lay a strip of plastic in the wall to stop damp rising up through the masonry. The DPC, as it is known, is usually placed at least 150mm above ground level in the outer leaf of a cavity wall so that it is normally above snow level and splashes from rainfall, or above the level of damp debris which might accumulate on the ground outside. If the ground level varies then the level of the DPC in the brick courses will probably vary to follow changes in the floor level. The DPC in the inner leaf may be at a different height, usually just below the level of floor joists so that they are protected. If there is a solid ground floor with a DPMdamp proof membrane - a sheet of (usually) plastic used to prevent dampness rising up through a floor or in through an underground wall. see more under it then the DPC and DPM are lap jointed. Historically, DPCs only came into major use in the early part of the 20thC. Before plastics were invented they were of lead, slate, engineering brick, bitumen, zinc etc. and in older buildings these may have corroded or been breached and be in need of repair. around window and door openings to prevent the frames coming in contact with the damp outer leaf of masonry. at the head of an exposed wall. 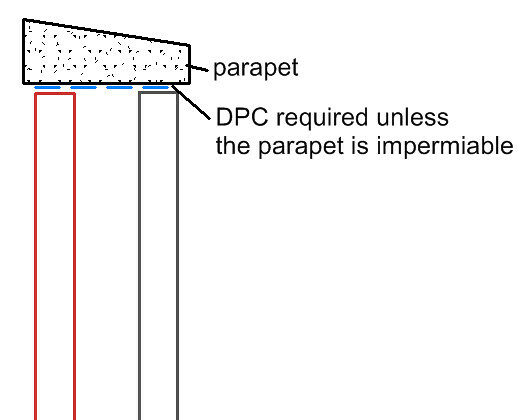 Parapets must prevent water getting to the insulation and internal wall below. Existing buildings may suffer from a lack of DPC if they are more than about a hundred years old (the 1875 Public Health act began to introduce them although it took nearly 25 years before they were universally used) or they may be breached (damaged). Using a damp meter on an internal wall is not an infallible way of diagnosing rising damp: walls may be damp because of rain penetration or because of condensation. 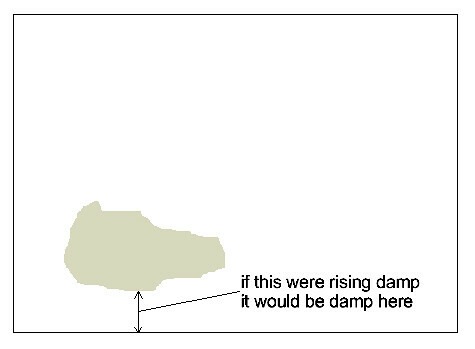 Rising damp will normally be in a strip along the bottom of the wall and be within the lowest metre. It will probably show efflorescence along the topmost edge where salts from the ground have been deposited as the water dries out. There are numerous ways of treating rising damp and many companies who undertake it. The main thing is to get a written guarantee from them. chemical treatment. This usually works quite well on plain brick walling but may not be effective in stone walls, particularly those which are thick, randomly coursed or have rubble infill because the chemical doesn’t reach the places it needs to. electro-osmosis. This is usually effective and relies on applying a very small electric current to electrodes fixed at regular intervals in the wall and connecting them to an anode in the ground. The science of how this works is complex but it effectively neutralizes the forces which help moisture to wick up a wall. 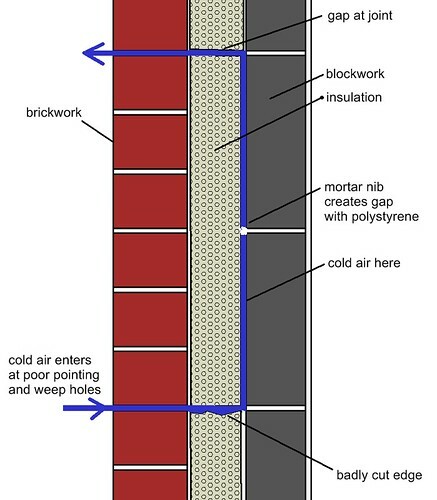 bricks such as the SmartDry type which allow air to circulate within the wall before being expelled. They are also used in situations where what is an external wall above turns into an internal wall below such as when a single storey[for the purposes of part B (fire) of the Approved Documents to the Building Regulations] this includes - (a) any gallery[for the purposes of part B of the Approved Documents] - A raised area or platform around the sides or at the back of a room which provides extra space. if its area is more than half that of the space into which it projects; and (b) a roof, unless it is accessible only for maintenance and repair. extension goes onto a two storey house. Note also that the internal / external wall shown in brown is potentially a serious thermal bridge for heat to escape from the inner leaf of the extension inside the house to the cold outer area above it. It may need to be of insulating blockwork, especially where the change occurs. The difference between cladding and rain screensthis is a (usually thin) outer cladding on a wall which prevents rain, snow, etc getting at the structure of the wall behind. see more on rain screens is not large but it is important. Cladding tends be fixed directly to the face of a building whereas rain screens tend to have an air gap between themselves and the wall. 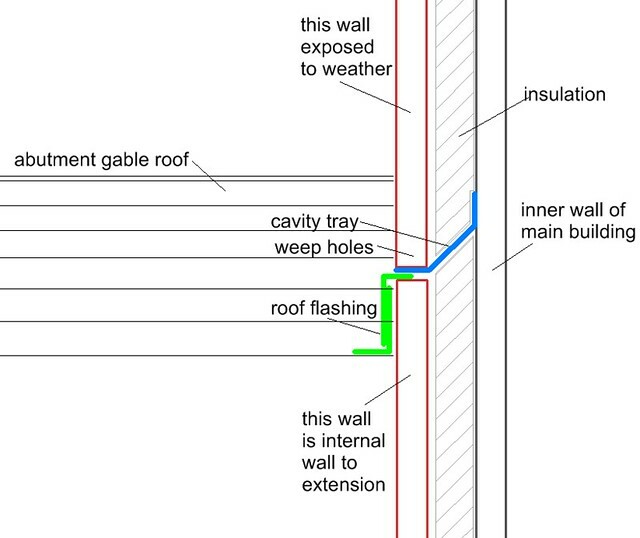 With cladding (such as tiles fixed directly to blockwork) there is a chance that rain water might penetrate joints between the tiles and then get drawn back into the wall proper. With a rain screenthis is a (usually thin) outer cladding on a wall which prevents rain, snow, etc getting at the structure of the wall behind. see more on rain screen, any water that might get driven by wind back behind the screen then drips out down the back of the screen to the ground. timber (note that there are some quite complicated rules in the Building Regulations about the proximity of combustible external wall materials to neighbouring buildings). The best fixings for rain screens are of stainless steel. Although slightly dearer they don’t cause staining and allow for easy removal of the screen for alteration, repair or reuse. Oak shingles are surprisingly little used in the UK. 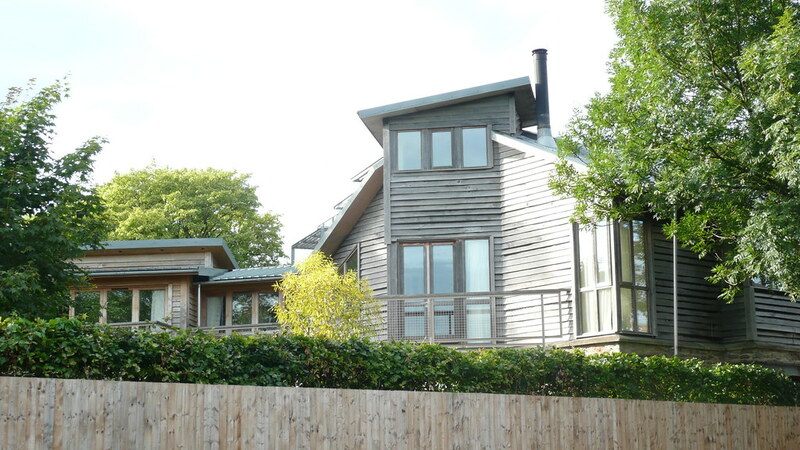 Below is an example on an eco extension to a former chapel at the Bridge of Lyon, Aberfeldy. Were traditional masonry cavity walls ever a good idea? The reason for cladding houses in a brick outer skin have more to do with a failure of modern design to take hold than with anything to do with structure: a retreat to some kind of ‘traditionalism’ which is costly in terms of space and energy. Unless you are building in some situation where space limits are not a problem (possibly a rural area) or costs are not an issue then the above adds up to quite a strong argument in favour of making as much of the wall thickness as possible out of insulation. This in turn suggests using timber frame systems such as SIPS or post and beamSubstantial, usually horizontal structural member. construction for the external walls. The type of rain screen material you can use may be limited by the fire resistance required by the wall. Especially if it is close to a boundary[for the purposes of part B of the Approved Documents] - The boundary of the land belonging to the building, or where the land abuts a road, railway, canal or river, the centre line of that road, railway, canal or river (See Diagram 17.) [for the purposes of part J of the Approved Documents] the boudary is defined here , the material may need to be non combustible in which case timber or plastic will almost certainly be ruled out. See Approved Documents part B1 of the Building Regulations. 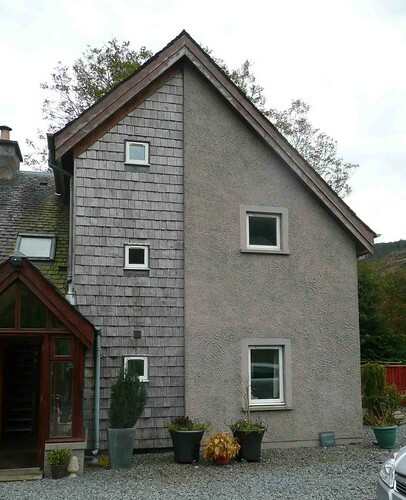 External wall renders (or harling as it is called in Scotland) has traditionally been of a sand cement mixture. Small size aggregate may have been added by throwing it at the render while still wet (as with roughcast, Canterbury spa and a host of others). the sustainability of the materials – see Building materials and life cycle analysis / Plasterboard. One of the deciding factors with internal wall construction is whether, and to what extent the wall needs to be load bearing. The qualities of high thermal mass and acoustic insulation tend to work together with heavyweight materials. Of the traditional methods for internal wall building, both concrete block and brick rate quite poorly in terms of embodied energy, sustainability and adaptability though they both score well on fire, thermal mass and sound reduction. Plasterboard on stud is quite good now that old plasterboard is becoming recyclable (see Wikipedia on gypsum recycling) and plasterboard walls are relatively easy to alter and remove, providing the floor level is consistent between rooms. Plasterboard is low in thermal mass (and not so good for sound insulation unless it is filled with acoustic mineral fibre). BASF has been developing gypsum based wall boards which incorporate microcapsules of phase changeswitching from liquid to solid at a certain temperature and thus releasing latent heat. In the case of certain building materials, this can be made to happen at, say, 20 deg. Celsius. The reverse also happens so these materials will effectively have a higher thermal mass than normal and can be used to store heat as they are warming up and release it as they cool down, This keeps them at a more stable temperature. (eutectic) wax substances (PCMs) which increase the effective thermal mass very considerably. See Knauf Comfortboard. Plasterboard can achieve high fire resistance if extra layers are added. With stud walling there may sometimes be a risk of compromising air tightness, especially with timber frame construction (see Air Tightness). This can occur if the joints with the adjoining external walls, floor and ceiling are not properly sealed and the joint also hides a break in the external construction thus allowing cold air to move straight into a ‘cooling fin’ within the house. There have been several fairly recent developments in dry lining boards for internal walls. Traditional plasterboard is being challenged by other variations of gypsum based boards and also by clay based lining boards. Lining boards usually have to have a degree of fire resistance both structurally and with regard to the spread of flame (Building Regulations: Linings and Structure) and this limits the materials that can be used. The problems with plasterboard have been to do with mining and processing the gypsum and also with the disposal of plasterboard because in normal land fill situations the calcium sulphate reacts with various acids also present in the land fill to produce sulphuric acid. Because of this, plasterboard must now be disposed of in special ‘toxic box’ sites designated by the local authority unless it goes for recycling. An added factor driving the change is that plasterboard has so little strength before it is fixed and damaged boards tend to litter many a building site so some of the newer boards tend to be less brittle and also tend to have a better finish. Most of the newer boards come from northern Europe and are still being imported which adds to the embodied energy and cost. Another factor is thermal mass; the newer boards help maintain thermal stability. Sasmox is 85% Gypsum and 15% wood fibre which gives it more strength and better fixing properties. It has its own proprietary joint filler and does not need plastering. It comes from Finland. Heraklith wood wool is a mixture of wood strands and cement which behaves well in fire and is also acoustically insulating. Made in Germany. This section, Part C, covers site remediationthe term applied to the method of dealing with pollutants and contaminants in the ground. The Building Regulations cover this in detail. See info about Approved Document C – Site preparation and resistance to contaminants and moisture along with protection from nasties which might affect the construction and occupants such as damp, rain, radon etc. There is an abridged version of the Approved Document specially for houses. There is a small section in the regulations concerning the use of urea formaldehyde insulation in cavity walls. See part DThe Approved documents, (England) part D, deals with toxic substances of the Approved Documents. The degree of sound insulation required within and between houses and flats is covered in Part E of the Approved Documents. 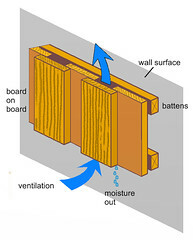 if you use a properly designed rain screen then the external walls should be OK. Any driving rain which might occasionally get through the rain screen should run down the inside surface of it and drain out to the outside so it will not wet the existing wall or new insulation. Air will circulate behind the rainscreen so this will allow any moisture in the wall to escape. See the section on rain screens above. Your guide page on walls and external insulation points to importance of avoiding condensation and allowing traditional walls to breathe. I have a 60s house with solid wall and plasterboard dry lining on wood battens. Sub floor is insulated under floor boards, attic space insulated above ceilings. Attic and roof spaces are both cold in winter and freely ventilated to space behind dry lining making internal walls cold. All the internal walls, other than where insulated in the odd place, are ventilated to the attic and sub floor. 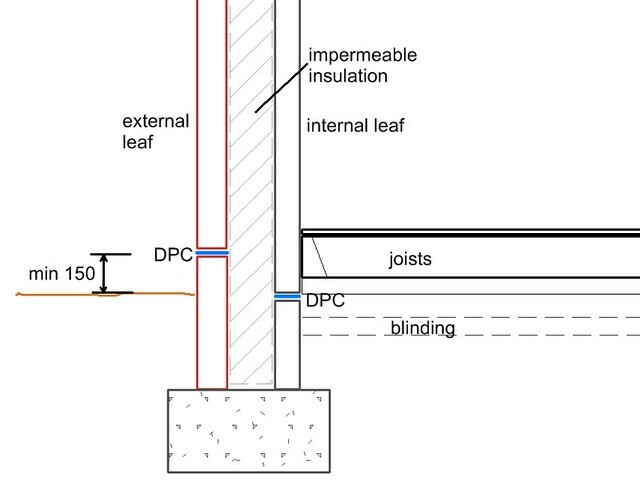 I want insulate solid wall externally, but unless cold air flow through dry lining space is reduced, and this space insulated, the benefits of ext insulation will be greatly reduced. However, I am very concerned that moisture coming in either from rain driven onto solid wall, or by condensation forming in solid wall could damage the joists and floor and the cost of repairs and disruption wiping out any energy savings many fold. 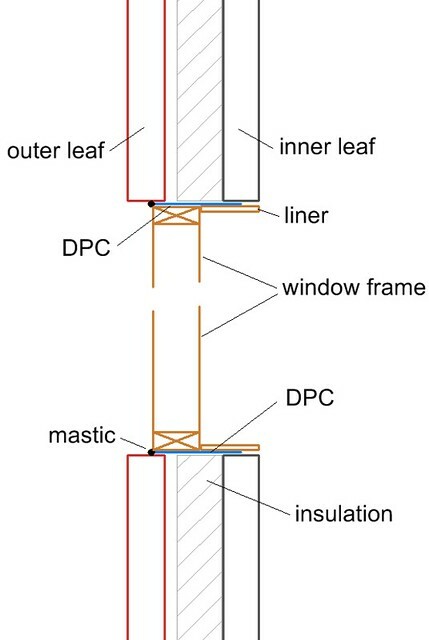 If a rain screen / wood cladding with ventilation space were applied to solid wall, will this prevent water getting into solid wall, allowing ventilation behind dry lining to be reduced and or this space insulated e.g with blown fibre? What is your advice? Hello, I have a mid 1960`s built timber frame bungalow which has a wood wool cement panel to the outside walls which has been screeded & pebble dashed, the wood wool cement panel is approx 30mm thick with a 15mm screed/pebble dash finish. The cavity between the inner plasterboard inside the property & the inside of the woodwool cement panel I estimate at 155mm or 6 inches. I am going to fill the cavity with sheep wool from the inside of the property by drilling hand size holes through the plasterboard & stuffing the cavity with sheep wool. Do you see any problems with this? Can you tell me what would be the thermal efficiency of my walls c/ Combining the 6 inches of sheep wool with the 30mm of woodwoll cement panel? I am finding it difficult to understand how thermal qualities are measured? Any assistance would be welcome to help me understand this? Dave Hart. Moorings,Shore road,Blairmore,Argyll,PA238TL. Tel;01369840849.